When the Vikings came to Ireland they mostly performed hit & run raids. There were no large towns or cities so their raids focused on settlements around costal areas. Ireland did start gaining a reputation as a place of Christian monastic settlements which brought more invading Vikings. The first inhabitants in the Dublin area date back to the Mesolithic period, when hunters roamed the region. According to written history, the first known settlement in Dublin was known as Átha Cliath (Ford of Hurdles). Located on the south bank of the River Liffey it took its name from a ford crossing the river. Wooden hurdles were placed on the mud bed of the river to make a crossing bridge during low tide. During the Christianisation of Ireland, a large monastic settlement was founded and located southeast of Átha Cliath. The Christian settlement was located beside a tidal pool in the River Poddle, Duiblinn (Blackpool). When the Viking longboats sailed into the River Liffey during the 9th century they built a longphort (ship harbour). It was also built on south bank of the River Liffey and would be used as a winter camp. When the Vikings began to settle in the area their settlement became known as Dyflinn. The strategic position of Dyflinn was perfect, located down river so it was further in-land but was also easily accessible from the sea. The used their settlement as a base for performing more in-land raids on places such as Leinster and Meath. After 4 years of settling in Ireland the Viking Chief called Thorgest met his fate. In late 845 the Irish King of Midhe, Máel Sechnaill (Malachy MacMulrooney) drowened Thorgest at Lough Owel. Afterwards, Máel would lead several victories against the Vikings including the slain of 1200 Norsemen at the Battle of Sciath Nechtain. By 849 AD, when Máel was the High King, the Viking settlement of Dublin had fallen to the Irish. The dark heathens came to Áth Cliath, made a great slaughter of the fair-haired foreigners, and plundered the naval encampment, both people and property. The dark heathens made a raid at Linn Duachaill, and a great number of them were slaughtered. By 853 AD a Viking leader called Óláfr inn hvíti (Olaf the White) claimed Kingship of Dublin, the first King in the emerging city’s history. Olaf would be joined by his brother, Ímar, and jointly ruled Dublin. In-land attacks by the Dubgaill Vikings became more frequent and they would often clash with Máel Sechnaill, the High King. However, at the same time the Norsemen formed alliances with other Irish Chieftains and became more involved in their internal Irish disputes. When the Dublin Vikings started concentrating more on Britain the native Irish seen this as an oppurtunity by attacking the Viking settlements. In 867 a Norse settlement near Dublin was attacked with a further attacks on Dublin, although this did little to stop further attacks from the Vikings. Ímar died in 873, the same year the king of Lochlainn died and a year later Olaf died during a campaign against the King of Picts in Scotland. 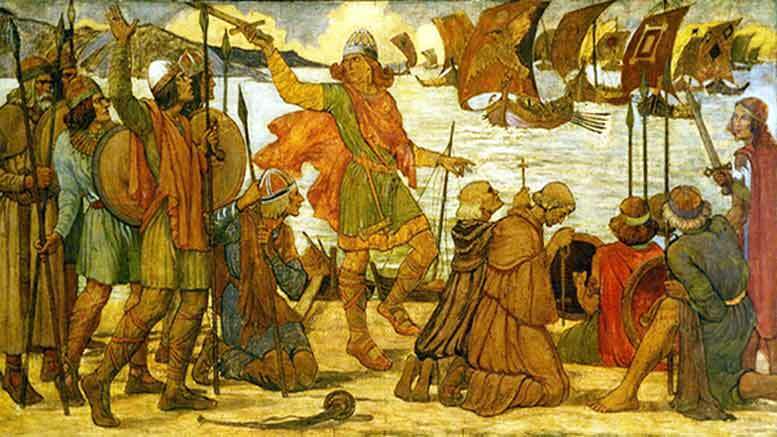 The death of the 3 Viking leaders brought uncertainty for the Norse Kingdom of Dublin. As the Norsemen continued life in Dublin the area became an important trading post. With links all over the world the Vikings would use Dublin to continue raids on Ireland and Britain, build ships, and even became known for its barrel making. Excavations of Dublin city in the 20th century discovered Duiblinn was a thriving Viking community, an important town and hub. The heathens were driven from Ireland, i.e. from the fortress of Áth Cliath, by Mael Finnia son of Flannacán with the men of Brega and by Cerball son of Muiricán, with the Laigin; and they abandoned a good number of their ships, and escaped half dead after they had been wounded and broken.